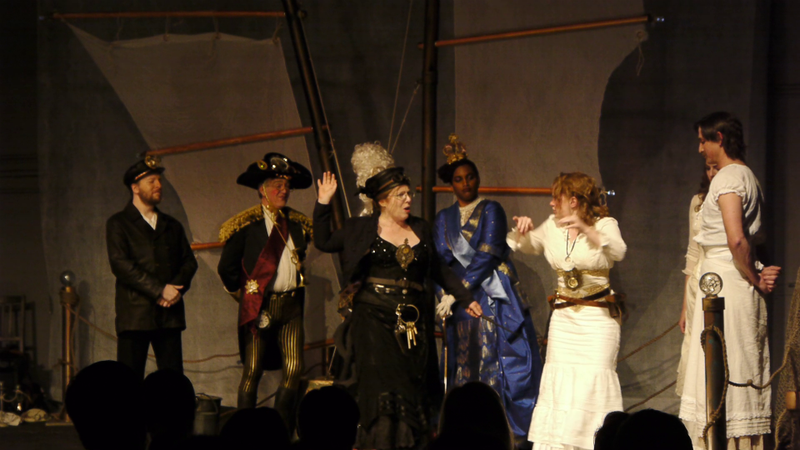 In this dystopian steampunk operetta, Queen Victoria II is on her way to inspect HMS Annelid, a scientific sailing ship à la Charles Darwin’s HMS Beagle, when she’s delayed by a bit of “climate strange and global storming.” Mermaid queens demand climate treaties, pirates in petticoats mutiny, sky pirates are shot from the air and must be rescued from the drink, and disguises and mistaken identities round out the intricacies of this homage to both Mozart and Gilbert & Sullivan. Delightful Edwardian-inspired costumes and dazzling mermaid garb cobbled together with artifacts from another time offer a nod to the archaeological and scientific frenzy of the Victorian era. Clever mechanical sets and ornate gizmos that hilariously malfunction add layers of interest to the show. The first act was presented as a teaser in Boston last year at the Great New England Steampunk Exhibition and is designed to be shipped in boxes to any locale, with rapid setup/breakdown. The show is designed to be presented in multiple venues and plans are in motion for a touring production. The Annelid isn’t any old flying/swimming/sailing vessel; it’s also a floating reformatory for wayward young women, who also serve as its all-female crew — between lessons in manners and etiquette and illicit games of dice and sword fights. Amelia, the queen’s niece by way of some obscure branch of the tangled family tree of European royalty, is being prepared to marry the Queen’s brother and become Queen herself someday. But Amelia has a pesky habit of asking too many questions and insisting that she be allowed to become a sky scientist, adventurer, and explorer (hence the “finishing” school). The queen’s brother, disguised as a sky pirate, “drops in” to check out Amelia, his intended. A trio of mermaids, the finest of the “specimens” in Darwin’s collection, are slated for vivisection as subjects of science, the empirical method — or are they, asks the pirate, in truth, subjects of the Empire and of the Queen? The mermaids make an impassioned plea for an audience with QVII herself, as the oceans are in crisis due to the activities of the land people. The ladies in training, the ship’s crew, mutiny and pretend to be Mr. and Mrs. Darwin for the Queen’s visit. Lively, naughty lyrics instruct us that “If we want to get ahead, we must make it our intent — to polish up the (br)asses of the one percent,” and there’s a can can that’s a rallying cry for female empowerment. In the end, it’s a bit of a morality play on efforts to control nature, both human and nonhuman, but the show is so much fun that there’s ne’r a preachy moment.